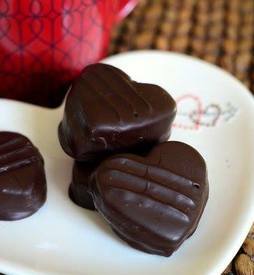 Chocolate dipped caramel hearts sandwich cookies! Dark chocolate, vanilla bean caramel and buttery chocolate shortbread cookies are the three components that make up these Chocolate-Dipped Chocolate Caramel Sandwich Cookies. They’re definitely a cut above your average cookie, with three components that are incredibly delicious on their own and even better when they’re combined. They do take a little extra effort to put together, but you can’t beat these when you are looking for a special cookie to make for your favorite chocolate lover or to serve for a special occasion.